Summer is here my friends and it hasnt come a moment to soon. There is lots being organised within our community  for your education, enlightenment and enjoyment  so get out there and get involved. 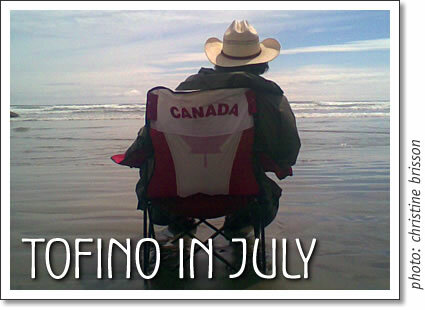 One of Tofinos favourite days has got to be Canada Day with all its festivities in the village green and in the harbour. Come out and enjoy the festivities with the Lunch BBQ from 12-3pm, Family Games/ Childrens Activities from 12-3pm, Salmon BBQ from 4-7pm, Beverage Gardens/Live entertainment in the Gazebo/ Silent Auction from 4-7pm and the Fireworks in Tofinos harbor at 10pm. All festivities are happening at Tofinos Village Green, funds raised will go to Village Green Improvements. The 6th annual Tuff City Skate Comp will be held once again this Canada Day. The competition kicks off at 9am with registration, Juniors start at 10am. The heats are 12 noon for the girls, 1pm for novice, 2pm for intermediate, 3pm for advanced the the awards will be at 4pm. Be sure to show early for your heat in case times change. Helmets are required to ride and are available there. The Raincoast Interpretive Center has a number of programs running throughout the summer. Many of their activities are outdoors and involve first hand experience with the rainforest. Most of the programs are designed for children and youth such as the Young Naturalists and Intertidal Investigators. There is a new theme every week so be sure to drop by the center at the Tofino Botanical Gardens. to see what they are up to. Adam Buskard has spent a years in Tofino and always has his finger on the pulse of what's happenin' in Tuff City. Tofino in July 2010: An overview of what's happening this month in Tofino, compiled by Adam Buskard for Tofino Time Magazine.